I cannot export artistic text to pdf when using an artboard. Export to jpg works fine. 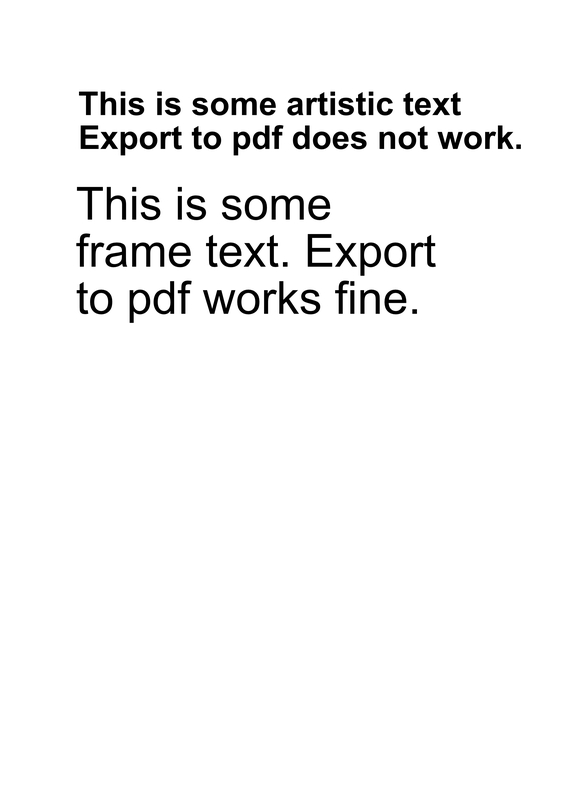 Not using a artboard export to pdf is fine. I didn't download your file (I'm using a mobile phone right now), but make sure the artistic text (any object really) is on/in the artboard layer if it is expected to output. Yes I can see that when I do artistic text it appears to go above the artboard layer rather than on the layer as frame text and other drawing elements do. I cannot see how to make the artistic text go onto the artboard layer. Also the export to jpg works as expected with the artistic text being shown. from other tools. The other drawing tools and frame text seem to go automatically onto the artboard layer if the artboard is selected. Artistic text always seems to deselect the artboard and go onto its own layer. You're right. The Artistic text tool is placing the layer above the selected artboard layer in the Layers panel. Thanks for reporting this. Issue logged to be looked at.